Garden care: In smaller gardens, surround the roots with a non-perishable barrier that restricts the plant's spread. I have just moved into a house with these bamboo planted along rear fence to block out neighbors.. They are about 2m high and there are 4 of them along 4m length. The bed in front of them is triangular shaped with another deciduous tree at rear. The bed measures 2.80 m long x 2m deep allowing for 1m growing room in front of bamboo. The bed faces Nth and east and will be in shade most of day in summer. Soil isgood, well drained, but dry. My question is what can I grow in this bed which will compliment Bamboo, and hot planting scheme used in other sunny aspects garden. The only shrub in and thriving is a green, yellow euymonious. I was thinking to add euphorbia purpurea any other suggestions please? Hello, I think a Euphorbia would be great and perhaps you could introduce a Japanese maple too. Alternatively a fern would help create a tropical feel. Hello there This is a clump forming bamboo so not as invasive as some, but I would still restrict the roots. We do have a bamboo control system, -I have attached a link below to this product. 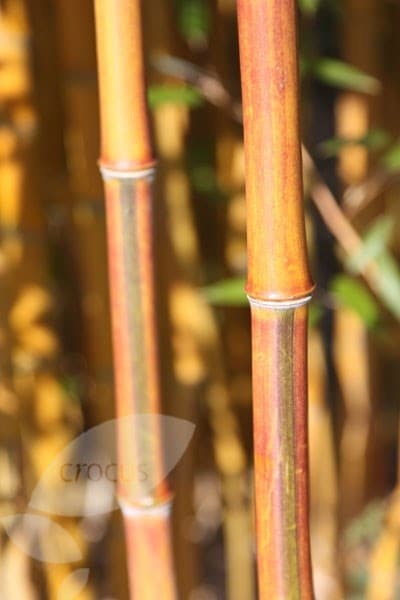 http://www.crocus.co.uk/product/_/bamboo-control-system/classid.2000019273/ Hope this helps. 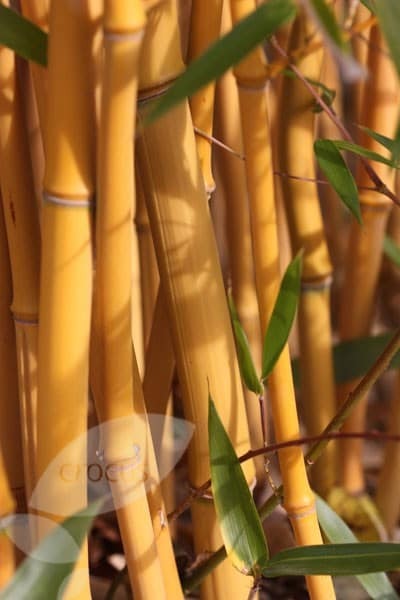 To feed bamboos in the growing season, what do you recommend as feed? Btw i have found the Q and A really useful - how about some more photos/videos of planting bamboo and examples of spread year by year? 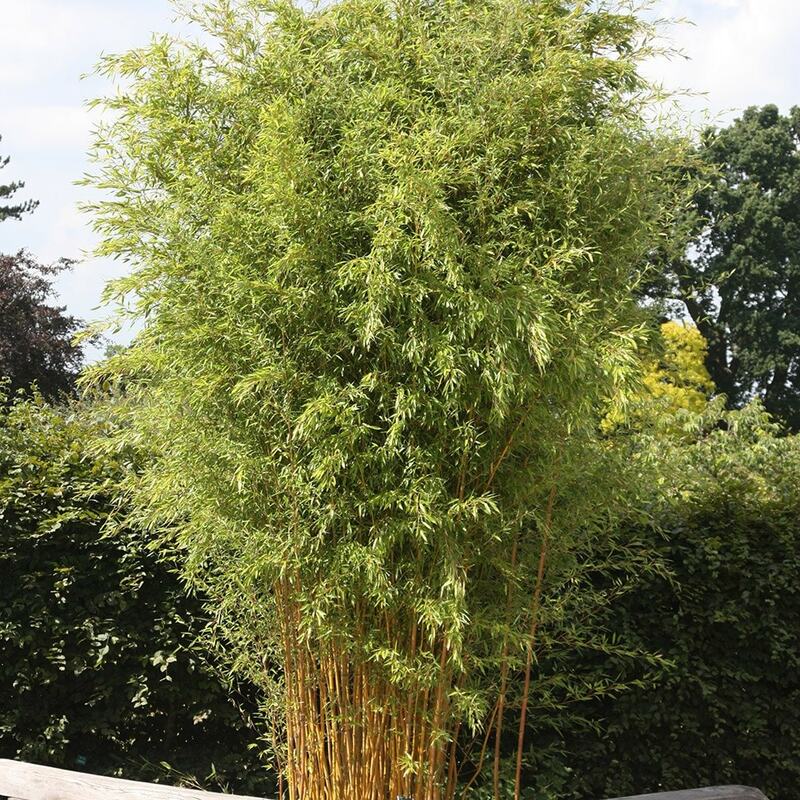 Hello there-we have just bought three phyllostachys-aureosulcata-spectabilis on your website. I am a little confused as to contradicting opinion of eventual height of this plant/bamboo. We read the spec that is alongside the option to buy on the right hand side and it says 6m tall which is what we need to block off the neighbours overlooking view but some of the comments in reply to questions on this forum say they grow to 3m tall- can you tell me which is correct? Thank you. Hello, It is very difficult to be too specific about plant heights as so much depends upon their growing conditions. These plants can have an eventual height of anywhere between 3 and 6 metres, so we have given the maximum possible height. How many stems in a 5ltr pot? How quickly would these spread? I am trying to cover a distance along a fence of approx 5.5m so need to understand how many pots to buy. Also, how deep rooting are they? Hello, It is difficult to say how many stems each pot will have as they will all vary. As a very general guide, I would say they will have between one thicker one or three thinner ones and they will be up to 1m tall. As for their roots, they can get about 1m deep and can spread to over 6m. As this is a spreading form it is not ideal for hedging, but if you can control the spread of the roots with a barrier system such as this one... http://www.crocus.co.uk/product/_/bamboo-control-system/classid.2000019273/ ...then I would advise planting them at 50cm intervals. Hi Please could you give me some more ideas of companion plants for this bamboo? I'd like to plants to be no higher than 60cm tall, with a mix of perennial and some evergreen plants. Also the size of the plot is only 1.5 meters wide.